I thought I knew zombies - the shuffle, the arms out, the groan of "braaaaaaains". Simple, right?Nope. Oh so wrong.Max Brooks, on the other hand, has been doing a lot of thinking about zombies - what makes them tick, what makes them die, and everything inbetween. Through an oral history a la Studs Terkel (if you don't know him get thee to this audio doc! He's a treasure) he relates all the details. They are so rational, so well thought out, that many times I found myself thinking, "That would totally happen. Of course. 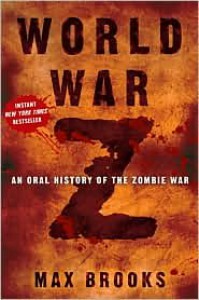 "The arc of the book can be split into three main sections:- What would a zombie apocalypse look like? Where would it start? How would people and governments initially react?- After humans get a grip on what the undead are really like how would they change their fighting tactics? Would it be enough?- What would the fight teach us about our world and ourselves? Would we be better off for the struggle, or forget all the lessons we learned in a generation or two?The interviews hop all over the world in search of answers. I was shocked when one subject was from Kyoto, Japan. I live in Kyoto! The shock was soon followed by dread - Japan is so hard to get right. I prepared to wince at gross generalizations and stereotypes... only to find none. There were unbelievable bits, sure,^1 but they were small and probably only bothered me. Along the way Brooks managed to comment on the Japanese educational system, otaku, hikikomori, and the Shinto religion. Well done.While I have no intention of seeing the movie I would love to listen to the audiobook - there is so much amazing material for actors to work with here. Each character has their own voice, tics, worldview, and of course, amazing story. At the end of the book we get a few paragraphs from people that appeared hundreds of pages prior and I remembered nearly every one.The episodic nature of the interviews could make World War Z easy to put down but the story kept pulling me back in. If you like apocalyptic fiction this is in your wheelhouse. If you like oral histories or epistolary-esque writing you'll be in love. And if you like deeper stuff about what makes humans human you're more than covered. Very nearly five stars.---^1 - The slang word he chose for zeds, saifu, means "wallet" in Japanese. Also, the guy escapes from a 19 story apartment tower but city zoning laws restrict residential buildings to roughly 10 stories. Admittedly nitpicks, but hey.